Book your luxury accommodation in Bali with the team that has the very best in Bali Luxury Villas & Bali Villa Accommodation. 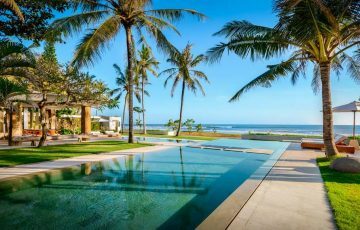 From the very popular Seminyak where we have gorgeous Seminyak Villas to the trendy & very hip area of Batubelig, Berawa & Canggu where there are beachfront luxury Canggu Villas close to Echo beach and the now popular Jalan Batu Bolong shopping and dining strip in Bali. For complete luxurious accommodation in your Bali Villas Seminyak where no expense is spared in making sure your stay is as special & memorable as possible we provide all the creature comforts and added extras that savvy world travelers would expect of their Bali Villas. Let’s start with the fact that all of our Luxury Villas are fully staffed with their own private team of housekeepers, maids and managers who are there to attend to your every whim and desire. Fancy a BBQ night or an impromptu, spontaneous dinner party? Not a problem, that can be organised as well as any special events such as a birthday celebration, wedding ceremony, honeymoon romantic dinner or even a family reunion. You also get gardeners, pool attendants, drivers, your own car as well as the obvious private pool and butler. You basically do not have to lift a finger as everything is done for you; even shopping for groceries and snacks. Plus, if you feel like exploring the island and doing the whole cultural thing, there is a driver and a fully air conditioned car waiting for you to take you anywhere you and your group want. This is also the perfect holiday solution for seniors villa accommodation in Bali. Luxury holiday living does not stop there. Whatever you need and whatever you may want the team at Bali Villa Escapes are more than happy to organise anything. The luxury and complete pampering really doesn’t stop there. You also get picked up at the airport, taken directly to your villa and from that point on wards you are in the hands of a professional team of villa staff who are on call 24/7 to handle any thing you may need. We have created this category for our discerning holidaymakers who have a certain standard and expect it to be maintained throughout their stay. Luxury accommodation is now affordable and within reach of most people who love to come to Bali on their holidays. Inquire today and be pleasantly surprised by the villa options and special deals we have. 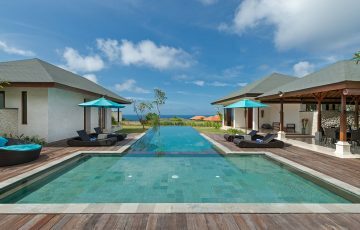 If your wanting the wow factor on your Bali holiday make sure you also take a look at our cliff top villas in Bali to rent. These really deliver the wow factor for those that love dramatic scenic oceanfront locations. 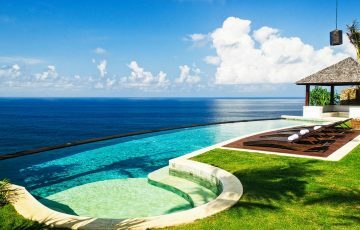 Upala Cliff Villa is a luxurious 4 bedroom Uluwatu villa with butler, housekeeping & free airport pick up. Peaceful location with ultra contemporary interiors make this a fabulous choice for your next Bali getaway. 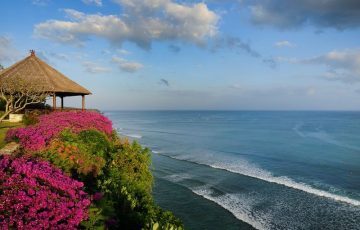 If you love Uluwatu and want a piece of heaven on holiday, this is it! If you want a luxurious cliff top holiday 5 bedroom villa with sensational views then Villa Grand Cliff in Ungasan is the perfect choice. Unparalleled luxury with world class ocean views to match. One of the best villas on the Bukit in Southern Bali to rent for your next holiday. 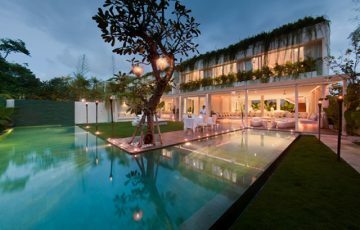 For those that demand the very best in their luxury Bali villa accommodation it really does not get much better than Ziva a Residence in Seminyak. This 3 bedroom ultra contemporary villa will leave you breathless. Plus it's only a short easy walk to the famous Ku De Ta & beach. If luxury is important, then Ziva a Residence Seminyak is the only option for you. Now everyone can afford to holiday in their own private beachfront Bali holiday villa. Villa Vedas is the perfect villa for families of groups wanting the peace and quiet of Tabanan as well as the exclusivity of their own private beach! That's right you get your own private stretch of beach all to yourself. Private butler, breakfast included, security & free airport pick up all at very AFFORDABLE prices. Majestic ocean views, being pampered by a team of villa staff all within the safe confines of a villa estate in the famous Uluwatu area. Villa Bale Agung is a 5 bedroom Luxury Uluwatu villa holiday rental and is your luxury escape from the world where you can enjoy unparalleled comforts for your family or group holiday in Bali. 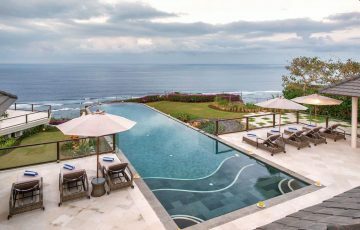 There are not too many villas in the Uluwatu area that can boast about the 5 star service and facilities on offer. Treat yourself and spend some time in this sensational villa. Luxury at an affordable price and only 5 minutes from bustling Seminyak. Villa Puteri is a wonderful 3 bedroom family or group villa in tranquil Umalas & is your ticket to a chilled out holiday in Bali. Take the kids, come with your friends, bring the whole family and enjoy this sensational villa. 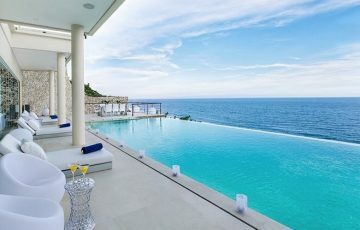 One of Bali's best holiday villas; Villa Tamarama at Ungasan clifftop resort is a 5 bedroom clifftop villa that has to be seen to be believed. Villa staff, gorgeous interiors and a swimming pool with the most stunning views you will ever see. For luxury it does not get better than this. 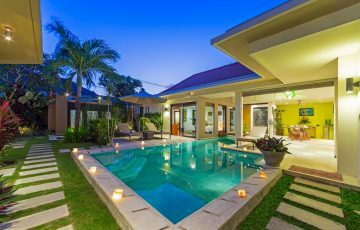 Luxurious 6 bedroom holiday beach front villa rental in the popular and extremely vibrant Canggu area. Plus Impiana Private Villas offers holiday makers an exceptional level of service from a team of professional staff. If your looking for the ultimate beach side holiday villa rental, then this is the obvious choice. Noku Beach House is absolute beach front luxury in Seminyak - what more could you ask for? 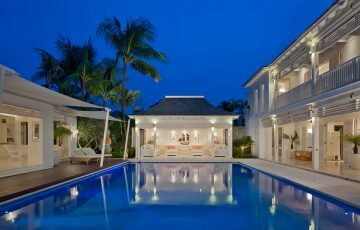 Read the reviews, see the photos & stay at this 6 bedroom gorgeous villa. You will love every moment here. 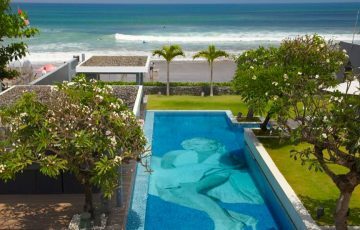 Villa Kayajiwa is an ultra luxurious 4 bedroom Canggu holiday villa rental in one of the best locations in Canggu. You are really close to Jalan Batu Bolong where there are loads of cafes, restaurants and the beach. With your own private chef & butler included with FREE airport pick up - this is one villa you have to see! Affordable luxury in a central Seminyak location. 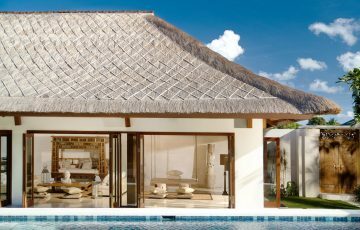 Villa Kamag is a 4-bedroom beauty that delivers luxury, style and 5 star service all rolled into one. 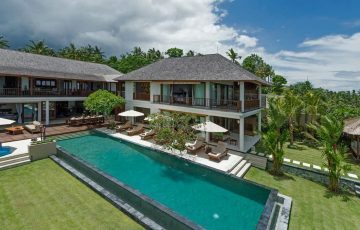 If your coming to Bali with the family or with your friends this is the villa you should be staying in. Take a closer look and see why this is such a popular Seminyak private pool villa rental. 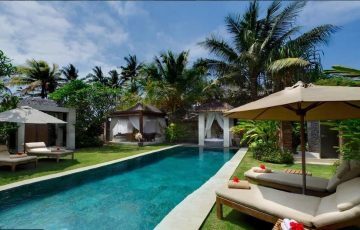 Villa Des Indes 2 is a level of 5 star luxury unlike any other in holiday villa rental in Seminyak. Enjoy being spoiled by your own chef and butler as well as having the luxury of 2 swimming pools. Balinese art and statues adorn the villas main common areas and bedroom to add authenticity to the place. 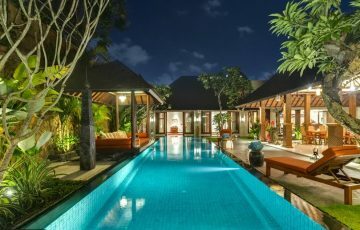 If being in a prime Seminyak location and being immersed in luxury is your idea of Bali heaven then Villa Indes 2 is a 5-bedroom paradise you should be renting on your next Bali holiday. 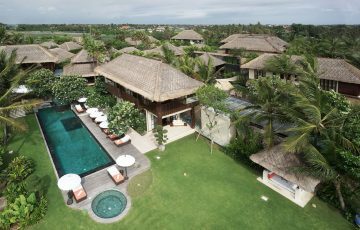 If your wanting to stay in a luxurious 10-bedroom Seminyak villa, then Anam is perfect! It's not only luxurious but it's also in a fabulous Seminyak location near Eat Street. If your looking for a spacious villa for your family or group, this is definitely one of the best in Seminyak to rent. 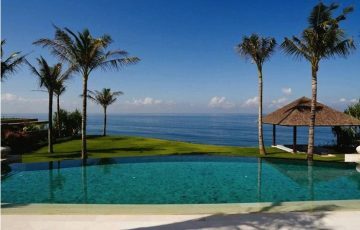 Soham Villa Bali, Award-Winning Ocean View Villa‎ - A Private 22m Cliff-Edge Pool, Gym, Sauna, Chef Villa in Uluwatu. Inquire Now and holiday in total luxury. Villa Hamsa represents the epitome of luxury tropical living; this 4-bedroom Uluwatu holiday villa rental is perched on the cliff-tops of the Bukit Peninsula providing jaw-dropping views of the Indian Ocean. Set within an exclusive private villa estate, guests will be treated like royalty by the professionally trained team of dedicated staff. The villa is child friendly and the beautiful Pandawa Beach is just minutes away! Just a 5 min leisurely stroll to the Seminyak’s pulsating ‘Eat Street’ Villa Elegancia is the perfect choice for those wanting to be right in the action. Built over two levels the villa boasts a unique interior design concept, packed with modern amenities and beautiful furnishings. The private pool stretches out into the outdoor area, perfect for swimming laps and suitable for young children as well. At the rear of the property is a private master suite for those seeking a little privacy. Who says size doesn’t matter? 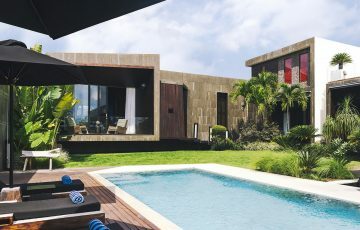 Villa Vie has five, spacious King Sized private bedroom suites, an extensive manicured garden with the centerpiece a huge L-shaped swimming pool, no doubt the scene for hours of quality time with the family. 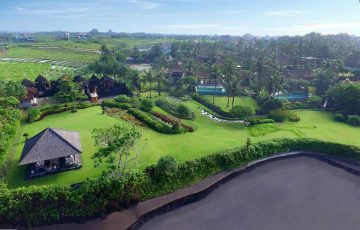 But probably best of all the villa is just 250 meters from Batu Belig Beach, thus providing the opportunity for a pleasant stroll into central Seminyak past two of the most popular tourist attractions, Potato Head and Ku De Ta Beach Clubs. 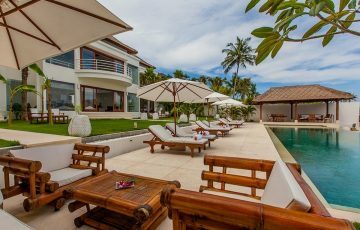 One of the best beachfront villas in Canggu - The Beach Villa Cemagi is a 5 bedroom fabulous holiday villa rental is fully staffed, with villa manager & is right on the water. With a gym, security, driver and villa staff this is a great opportunity to enjoy luxury holiday villa living. 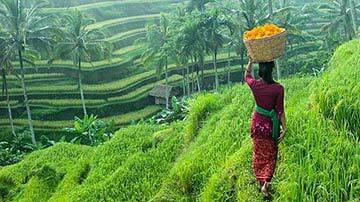 Travelling to Bali with a large group of friends or extended family? Villa Tjitrap ( 6 bedrooms) is the ideal choice providing luxury accommodation for up to 12 lucky guests. The villas outdoor setting is something dreams are made of, a massive private pool, traditional Balinese shingle roofs and swaying coconut palms blend perfectly to create a very special, tropical setting for an unforgettable Bali holiday. Near Eat Street, expansive grounds with a lavish swimming pool, lovely staff to take care of all your holiday needs, free airport pick up in a peaceful location - rent La Villa Des Sens, as its one of the best luxurious 3 bedroom Seminyak villas for your next Bali holiday. 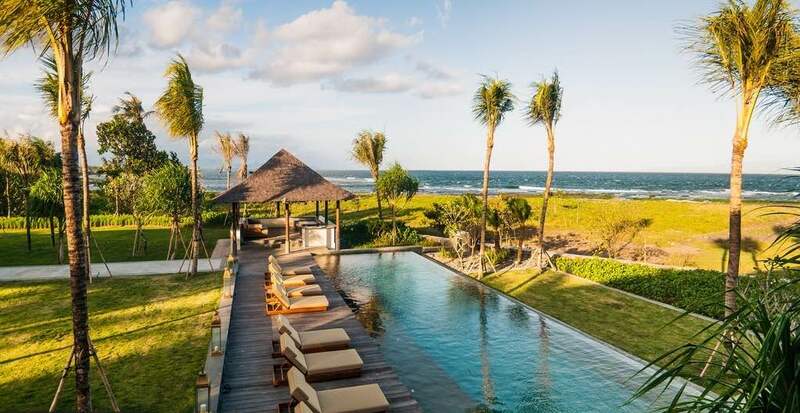 With an absolute beachfront location on Bali's east coast, Villa Gita Segara is one of those luxurious Candidasa holiday villas that will leave you breathless. This has everything you could possible want for a fabulous Bali getaway. Plus the price is very reasonable considering the amazing location. Villa Lucia is beachfront luxury 4 bedroom holiday villa rental in in idyllic seaside village of gorgeous Candidasa. 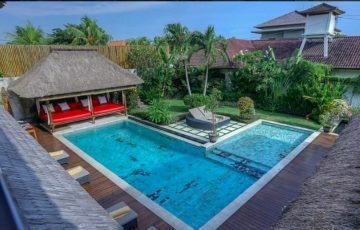 Private pool, chef & free airport pick up make this a fabulous choice for those wanting a relaxed and chilled out ' beach style' holiday in Bali. 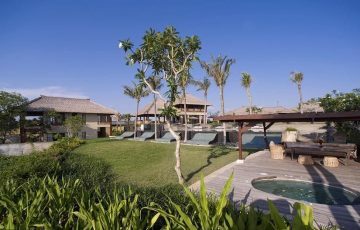 Villa Ambalama is a luxury 5 bedroom Canggu Villa & is located moments to the peaceful Cemagi Beach. Fully staffed; chef, butlers & housekeeping & only 15 minutes to vibrant Canggu central. If your after a secluded villa in a wonderful and very chilled out location then Ambalama is ideal. Arnalaya Beach House is an amazing beachfront 5 bedroom holiday villa. It's located on Neleyan beach which means you get the best of both worlds. 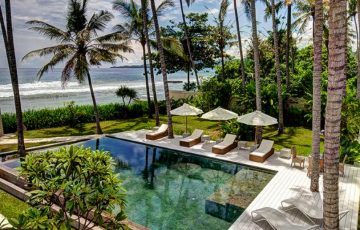 A relaxing and very private beach side location yet 10 minutes to the fun and exciting Batu Bolong area in Canggu central. Luxury on the beach! Villa Casa Evaliza ( 4 bedrooms ) is a beautiful representation of Balinese design elements amid sophisticated living and accommodation spaces. Just 250 meters from Bali’s most iconic landmark, Ku De Ta Beach club, guests have the luxury of easy access to the best part of Seminyak Beach. They are also close to the cosmopolitan Oberoi Strip where you will find the high end boutiques, cafes and let’s not forget to mention La Lucciola, easily one of Bali’s most popular restaurants. 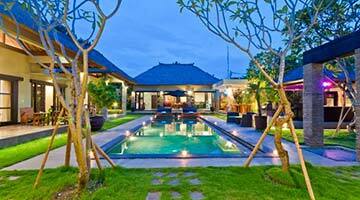 For luxury and convenience this is the one of the best holiday villas in Seminyak. 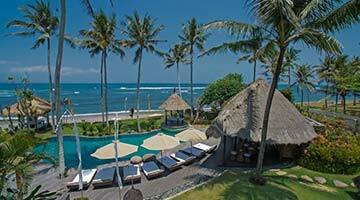 Villa Batujimbar is a fabulous beach front 9 bedroom holiday villa. 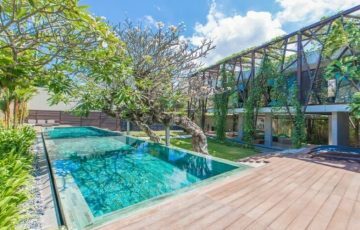 If the idea of holidaying on the beach in the lovely area of Sanur appeals to you, then you really need to take a look at this luxurious Sanur holiday villa that's absolutely gorgeous. 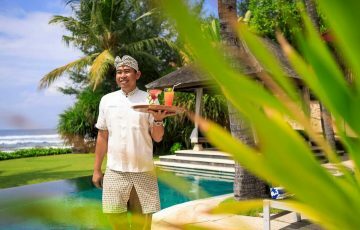 Chef, butler, fully staffed and only 150 metres from Sanur's centre - this is the ultimate Sanur group or large family villa. Mick Jagger, Sting, Yoko One & the Royal Family stayed here so your in good company! 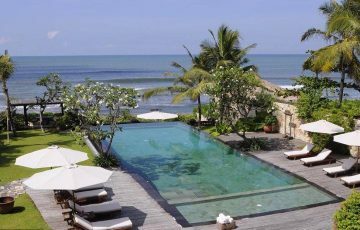 Holiday luxury in one of the most popular areas of Bali; Canggu. 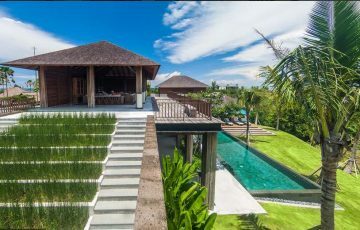 If your coming to Bali with the family and want to spoil the kid, then a week or two at Villa Waha in Canggu should definitely be on your bucket list. If your idea of holiday bliss is Balinese serenity mixed with first class service then head over to Jimbaran. It's here you'll find this fabulous 5-bredroom sensational Villa Uma Nina. 5 star service & world class facilities make this one of Jimbaran's best family or group holiday villa rentals not to be missed. Car & driver included with free airport pick up. Villa Bayuh Sabbha is set on the cliff tops of Uluwatu where you will be mesmerized by views of the Indian Ocean from your private pool, to the living spaces and private en-suites that combine to make up this beautiful luxury holiday Uluwatu villa. 5 bedroom suites are located in individual pavilions providing additional privacy for the discerning traveler. The nearby area is home to Bali’s best beaches, particularly for the surf enthusiasts. 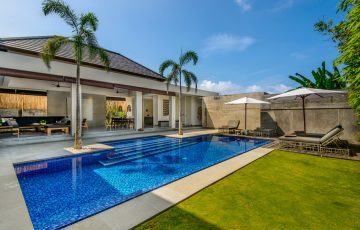 I you want to stay in the trendy Canggu area this 5 bedroom luxurious holiday villa is perfect for you, your family or your group of friends. Take a close look and see why Villa Kalyani is such a popular choice. 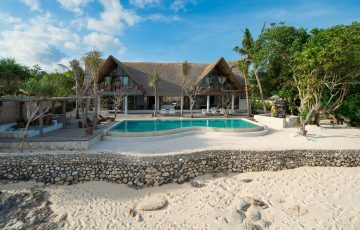 Beachfront luxurious 4 bedroom Sanur villa holiday rental that perfect if you want to escape the crowds and have that Bali beach style holiday with your family or friends. 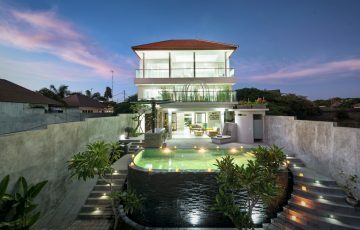 Villa Pushpapuri is affordable luxury for everyone to enjoy in laid back Sanur. 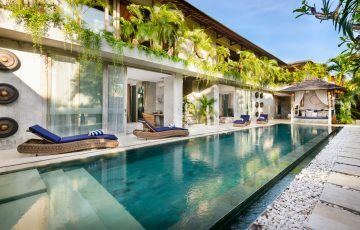 Villa Lulito is one of our most popular luxury 4-bedroom Seminyak holiday villas for obvious reasons; lots of class and a rarely witnessed level of sophistication; Villa Lulito takes luxury tropical living to a whole new level. As you relax by the pool whilst enjoying butler service you could be mistaken for thinking you’re living it up in the Hamptons! A 5 min stroll brings you to Ku De Ta Beach Club as well as Jalan Kaya Ayu ( Eat Street) where all of Seminyak’s best boutiques, cafes, restaurants and bars are conveniently located. Just imagine being 100 metres from the ocean and having a team of villa staff taking care of all your holiday wished. Well this is the reality of what tropical luxury holiday living is like when you stay at Villa Asada. Nothing is spared in making sure your stay is sublime. Immaculate interior finishes with a gorgeous swimming pool combine to make this one of the most luxurious holiday villas in Candidasa. If your thinking about escapes the crowds and want to really know what it's like to be completely pampered in total tranquility, then take a closer look at Villa Adasa. One of the most luxurious holiday villas in Nusa Lembongan awaits you. With an absolute beachfront location, 5 superbly decked out bedrooms and a team of willing villa staff to make sure your stay in this wonderful island is nothing short of sensational. The ideal beach style holiday villa with a gorgeous swimming pool, schools of tropical fish waiting to be discovered in the reefs just outside the villa and an open plan layout; Villa Voyage is one of Nusa Lembongans favourite villa for any one wanting the peace and harmony with nature that only this place can provide. 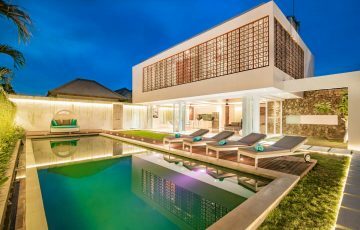 A fantastic 5 bedroom luxury Seminyak holiday villa rental that will leave you feeling completely relaxed after spending a few days here. Close to Seminyak, Canggu, Berawa & Batu Belig which means you in a really central location. A fabulous swimming pool, friendly staff and divine bedrooms all complete with en suite private bathrooms. 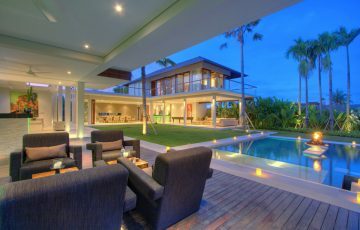 This has got to be one of the best villas in Seminyak. When you sit back on the softly cushioned, built-in sofa, you might just think you’re in the Garden of Eden! 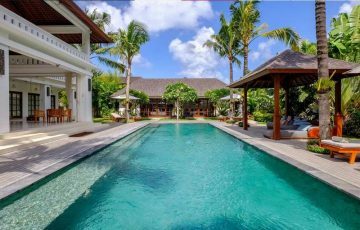 This 8 bedroom Seminyak villa is designed for guests to enjoy tropical indoor/outdoor living with a huge open-air entertaining area and azure L-shaped pool. The villa can accommodate up to 16 guests making it perfect for private functions and large groups wanting holiday together. On top of that, Batu Belig Beach is in easy walking distance and the very popular La Laguna Beach Club as well as Finns Recreation & Beach Club. 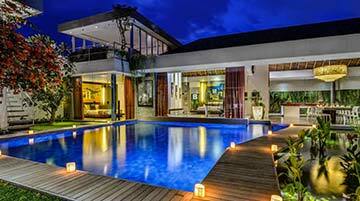 Villa Santai Sorga is one of the most luxurious 5 bedroom Ungasan holiday villas to rent in Bali. Clifftop location with world class ocean views and a team of villa staff to cater for your every desire. 5 bedrooms is perfect for a large group or large family get together. 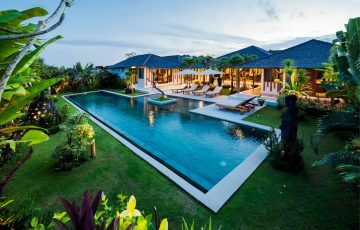 Villa Santai Sorga is luxury on a whole new level, so please read the reviews, look at the gorgeous photos then contact the team at Bali Villa Escapes to secure your slice of holiday heaven. 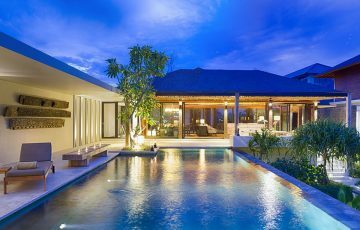 If you want to see the real Bali without the crowds and stay in one of Bali's best 8 bedroom luxurious Tabanan villas then you have to take a closer look at Kaba Kaba Estate. 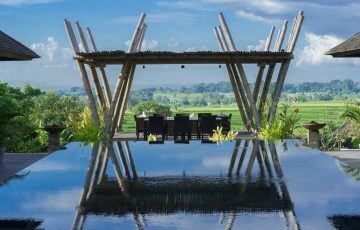 Surrounded by rice fields this villa is the epitome of privacy, luxury and service combined to make your Bali holiday truly memorable. There are also lots of modern luxury facilities to keep you and your guests entertained for days; tennis court, gym, spa etc etc. Ocean front luxury from this 3 bedroom Sanur villa holiday rental, Villa Majapahit Raj. Has everything you could possibly want for a fabulous family holiday in wonderful and laid back Sanur. 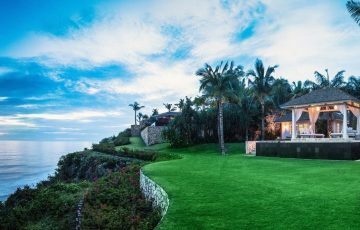 Includes: private butler, chef, security, free airport pick up in a gorgeous location. 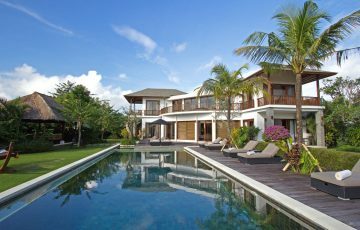 If you want a luxe ' beach style' holiday then this is the perfect Bali villa. 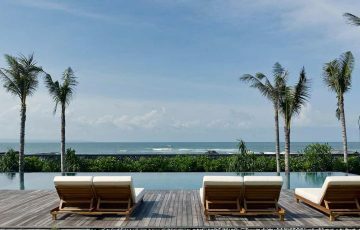 Villa Marie is a newly built luxurious holiday 6-bedroom Uluwatu villa in Bali featuring contemporary design and the very best of modern amenities. 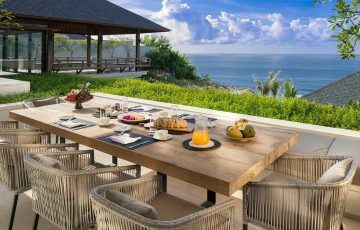 Situated on the Bukit Peninsula at Uluwatu, the villa is located within the safe confines of the exclusive Pandawa Cliff Estate. This villa has it all when it comes to activities and facilities; flood lit tennis courts, a squash court and a 17 metre private pool, perfect for a refreshing swim after some competitive fun on the courts with friends and family. 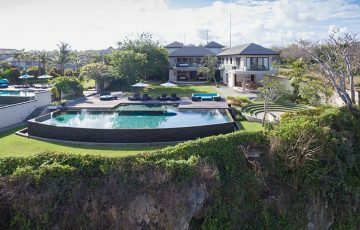 Possibly one of the most luxurious villas in Bali, with amenities that may match those of a royal holiday palace, Villa Pala at Pandawa Cliff Estate in Uluwatu is a luxe 6 bedroom villa & is a popular choice for international jetsetters from around the globe. With uninterrupted views of the Indian Ocean from the al-fresco dining areas and amazing infinity pool, accommodation for up to 12 guests and 24-hour butler service, Villa Pala Pandawa is the stuff dreams are made of! 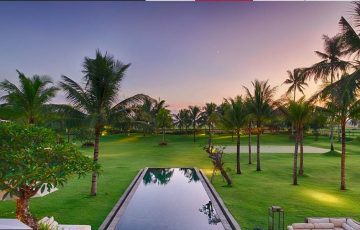 Villa Mandalay is set within the verdant rice terraces of rural Canggu, offering guests complete solace, peace and unrivalled serenity. 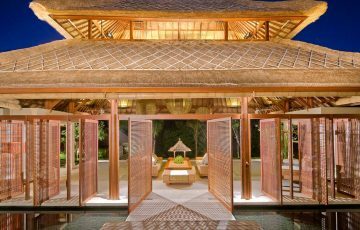 The villas traditional Balinese design elements, enchanting artworks and ornaments, combine seamlessly with the villas tranquil water ways. The villa is located close to peaceful Seseh Beach where can take relaxing afternoon strolls and witness magical sunsets. Villa Pawana is a sensational 5 bedroom cliff top holiday Ungasan villa rental - you will love the views from this family friendly villa that's designed for maximum comfort, privacy, security and overall ambiance. 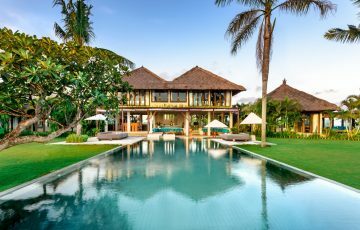 If you want to escape the crowded tourist areas of Bali and immerse yourself in pure luxury then it does not get much better than Villa Pawana.